You are here: Home / Kitty Wisdom / Happy Birthday to Marg! 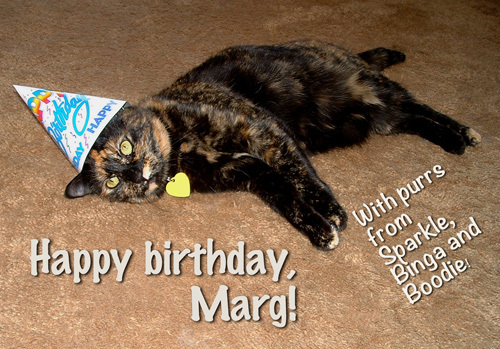 Binga is celebrating Marg’s birthday… I think she may be celebrating too hard! Happy birthday, Marg! Have an awesome day! Oh Binga, you always give us a chuckle, you go girl! (It looks like you “went”!) What a cute post in honor of Marg! Binga! Someone photoshopped that humiliating little birthday cap on you, didn’t she? Pfft. Haha, no Photoshop! That is why she is wearing it and I am not! Marg is one wonderful lady! We wishes her a pawsome birthday! We wish the very best to Marg! She is a great and selfless lady who contributes so much to those in need. We hope she has a fabulous day. Happy, Happy, Happy Birthday to the wonderfully special Marg!!! That’s so nice! We can just imagine the 3 of you having a specila party there for Marg. I’ll drink to that! Looks like Binga drank to it already. HAH!